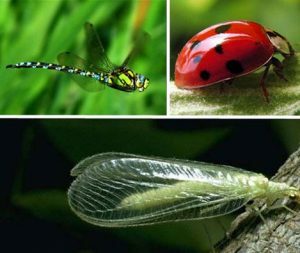 Beneficial insects (sometimes called beneficial bugs) are any of a number of species of insects that perform valued services. 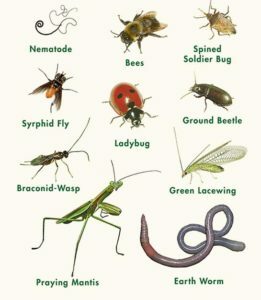 These helpful creatures aid in decomposing plant material and plant waste and breaking it down into fertilizer, pollinate crops, aerate and improve soil and devour pests which are harmful to your crops. For this reason, you should consider keeping them around. The best way to draw these beneficial bugs into garden is by growing their favorite flowering plants. Even though predation is the goal, most predatory insects also need nectar and pollen as a source of food. That’s because they are often predatory in just one stage of their life cycle (most insects go through four stages in their life cycle: egg, larvae, pupae and adult), but need these plants-based food sources in other stages. Research shows that ample flowers not only sustain adult beneficial insects, but also allow longer survival and production of more progeny, thus increasing the biological control of undesirable insects. Use a wide variety of attractive plants. Plants that flower at different times of the year can provide beneficials with nectar and pollen when they need it. Don’t use pesticides — these kills beneficials too, which usually have a slower reproductive cycle than your pests, so the pests will quickly bounce back into a beneficial-insect-free environment….